Most bodies in this country are shrouded by a gold silk sheet and cremated; some are shrouded in white and buried under a cross or facing a holy land; a small number are even left atop high towers to be shrouded by starving vultures. But Dhiraj didn’t want to go that way; his shroud – he had decided – would be a robust dust jacket, stacked atop other dead ideas, and sold for cheap on wheeled book-carts at railway stations. All the dead ones made it to the top of the pile. So, while he waited for his train at Mumbai’s Bandra Terminus, Dhiraj found himself unconsciously approaching the book-cart. Or was it the book-cart wheeling towards him? The two met midway, and Dhiraj began to scout the recently lifeless names he envied. Khushwant Singh and Harper Lee all the way at the top, Abdul Kalam and Umberto Eco piled up in large volumes below them, Jackie Collins and RK Laxman not far behind. Never before had the dead risen so gloriously! Dhiraj’s eyes sharpened with further envy at the sight of The Rakshas Chronicles – his only published work – hidden deep down in the bottom of the stack, giving company only to desiccating hardcover books which didn’t even merit a title on their side covers. The platform evolved from dusty grey to dusty orange under the blessings of the rising sun. As Dhiraj stood there, one hand on his fat brown suitcase, the other playing with the bristles on the side of his otherwise bald head, he heard two familiar voices. The first one was the sound of a bellowing moo, the incoming train rushing towards him like the world’s fastest electric cow. The Swaraj Express. The second voice was right behind him. A sharper, nasal sound that shook Dhiraj back into full consciousness. His closest friend. “Good morning Dhiraj,” Ram said. Dhiraj turned to see Ram, little, collared-shirted, spectacles-two-sizes-too-large and trousers-pulled-far-above-his-belly-button Ram. Behind those spectacles and that obtrusive long nose, his face was empty, expressionless, a blank page resisting to be written. Dhiraj reached below his berth on the train, his seat-bed – seat in the day, bed at night – and from the suitcase he had hoisted onto the train that morning, he pulled out a stained white plastic bag. His fingers trembled with excitement as he made a rustling racket of the plastic and retrieved a stack of papers from the bag. Then more stacks. He needed two hands and half of his flabby upper body to lift the pages out and place them on the table between Ram and himself. Remnants of spilled yellow daal and sprinkles of biscuit crumbs unwiped from the night before layered the table, and remnants of Dhiraj’s work lay scattered above it. He brushed back the remaining strands of his hair again, looked at Ram, and smiled. Ram took a moment to scan the brick of papers between them, leaned back into his seat, and folded his arms together. “This is it.” Dhiraj replied. Ram poked his spectacles deeper into the crevice above his long, dark nose. Slowly, he reached forward to allow his fingers to flip through the pages of Dhiraj’s manuscript. Dhiraj leaned back into his seat and folded his arms. The corner of his lips curved into a sly smile. “Eighteen hundred twenty seven,” he said. There is an annoying infinity to a good idea, and Dhiraj had good ideas all the time. He only needed to glance outside his window for instant inspiration. He wanted to write about the dog-sized rats scurrying on the train tracks, plotting mighty wars against other dog-sized rats for scraps of leftover roti and extend their rat kingdoms. He wanted to imagine how the delay in any one train – say, their Swaraj Express that morning that failed to transport Young Man A to Destination B in time for a job interview – would set off a chain reaction that would forever change the economic future of the country. He wanted to write about the sombre elderly woman who walked past him on the train dressed in a widow’s white sari. Of her husband, her loss, and the uncertainty in her future. – But, hey! That was not an idea he wanted to be thinking about. Good ideas, Dhiraj. Only the good ones. But, there was an annoying infinity to every good idea, because Dhiraj knew that he could never finish it. It would appear to him out of nowhere, a Big Bang to create a universe of thought out of nothing, and then just expand, and expand, and expand ad infinitum until all the chaos and entropy of his thoughts left him with a Black Hole instead of a story. Life was a good idea, he thought, but it was all too finite. It never lasted long enough for a perfect ending. If he couldn’t find a perfect ending to his idea, at least he could work on getting one for his life, right? Here’s how it all began. The bullet lodged into Malleshappa Madivalappa Kalburgi was still searing hot when Dhiraj Wadhwa in Mumbai, hundreds of kilometres away from the Kalburgi residence, heard about the dead author for the first time. The news of Kalburgi’s death – debated and politicised loudly by talking heads on every news channel on the country – sparked a new life in Dhiraj. He bounced up off his desk, left the TV running, and shouted an inconclusive “I’ll be back later” to his wife at their canteen. An hour later, he was at the Asiatic Society of Mumbai hunting for English or Marathi translations of Marga Volume 4. He didn’t find any. Karishma was waiting for Dhiraj at the canteen’s manager’s desk when he returned. “Exactly,” Dhiraj sneaked past her and into his office. He took a few hearty afternoon gulps of Old Monk and set himself back to work. Dhiraj liked to believe that his office, and particularly, the stack of papers on the top shelf in the middle almirah behind his desk, made Dadar Veg Treat truly unique among other canteens in Central Mumbai. Or maybe, the entire city. Of course, no one but Dhiraj had laid his eyes on the stack, on the eighteen hundred plus yellowing white sheets of scribbles and notes and stories and genius, which is why Karishma had to work twice as hard outside his office to keep alive the real calling card of the canteen: it’s delicious, oily hot food, prepared with whole-hearted shares of Mumbai spices, served with the city’s trademark jovial rudeness, and topped off with just a pinch of appropriately unhygienic kitchen conditions to keep their few loyal customers coming back for more. Those loyal customers, however, had been diminishing. Back in the mid-90s, soon after Bombay became Mumbai, Dhiraj’s father-in-law coaxed him to invest everything he had earned off of The Rakshas Chronicles on Dadar Veg Treat, which was to be “Dadar’s most exciting and tasty and also paisa-vasool new culinary destination.” It had seemed like a great idea at the time. Every morning, an army of young, white-shirted, bespectacled working men (and occasionally, even a woman or two!) queued up outside the metal shutters when he and Karishma opened up for breakfast. They waited for Karishma to finish her morning prayers first: she rang her little bell, prostrated in front of the shutters, and lit an agarbatti, before all hell would happily break loose. Dadar Veg Treat stood on a corner as a flagship into one of Dadar’s busiest pedestrian streets, the midway respite between the local train stations and the office buildings. Inside, the canteen had little sitting room; instead, Karishma had erected dozens of round standing tables around which hungry Mumbaikars huddled around as they gobbled mouthfuls of fried nourishment down their throats. A small army of blue-vested waiters shouted signals to one another over the hypnotic hum of conversations in the crowded main foyer of the canteen. The waiters delivered metal plates of vada-pavs and paani-puri and pav bhajis from the kitchen to the customer. Each transaction ultimately went through Karishma, who sat behind the manager’s desk at the door watching the culinary stage play out another day of activity. She kept an adorned stone idol of Ganesha behind her, its round belly serving as the perfect deity to watch over the daily scenes of minor gluttony. Every once in a while, Dhiraj sat at the manger’s desk, too. As the customers hurried in, he enjoyed how their rubber soles created a joyous scratch of activity against the dusty floors and their conversations brought a high-decibel hum that waved higher at lunch, simmered a little by tea-time, and exploded into a thrashing chorus by dinner, only to stay echoing with Dhiraj long after the shutters were pulled back down at closing time. The smells of fresh, fried foods and an onslaught of delectable masalas flavoured the humid heat of every day, and hundreds of cups of piping hot chai added a sweet, warm finishing touch to each meal. But Karishma and Dhiraj’s trump card were their vegetarian burgers. While most of their competitors settled with usual local snack and chaat options, Karishma introduced Western-style delicacies to his canteen. Soon, Dadar Veg Treat gained popularity for those aloo burgers, spicy grilled potato wraps, french fries, and – another crowd favourite – fountain drinks. The going was so good that, for Dhiraj’s 27th birthday, Karishma had the sign outside the canteen upgraded to better identify their new, intercontinental identity. Dadar Veg Treat – Where East meets West. But then, one month after Prime Minister Vajpayee held the Pokhran-II tests up in Rajasthan, Dhiraj was bombarded by nuclear news of his own. McDonald’s had made it to town and set up shop less than eight minutes down the road. McDonald’s, with its evil, welcoming yellow arches, plastic trays, and a giant clown that turned every child in Mumbai into an intractable addict. “Why didn’t we think of our own clown, Karishma?” McDonald’s, who had the best aloo burgers and potato wraps and fresh fries that Dhiraj had ever tasted – of course he had to taste it, it was for research! But worse than anything, McDonald’s had an added clincher: meat. Sweet, heavy, melt-in-your-mouth meat, which felt good going in and continued to feel better hours after digestion. Meat so unreal that it tasted like nothing that the city had ever tasted before. Mumbai was hooked. Within months, as more Yellow Clowns took birth around the city, the dietary preferences of the city morphed dramatically. Other restaurants and canteens in the city followed suit, until Dadar Veg Treat’s intercontinental identity wasn’t so unique anymore. One night, after the second month of McOnslaught, Karishma tossed restlessly in bed next to Dhiraj, complaining that new blasphemous meat eaters were being born every day. “Not since you married me, you’re not,” she pushed him away to the edge of the bed. Dhiraj and Karishma’s apartment was in the same building and just a floor above their canteen. Dhiraj had grown accustomed to sleeping under the whiff of peeled potato skins. Accustomed to the haunting temptations of fried chicken from other restaurants in the neighbourhood. “It’ll be okay…” he reached closer to hug her. Despite the lustful cocktail of insecurity and Karishma’s flimsy polyester nighty, they weren’t able to conceive a child that night. Conception failed them when RK Narayan died, but it did send sales of those Maldugi books back up into a tizzy. They didn’t conceive when those taxi bombs went off in Zaveri Bazaar and the Gateway, when Amrita Pritam died and every quasi-intellectual Dhiraj knew grabbed a copy of Pinjar, or when Raj Thackarey scared his North Indian friends back to their home-states for a few days. They couldn’t even conceive during those three days in November 2008 – what else could they have done during those three days in November 2008? – when ten men tested Mumbai’s resolve more than ever before. They failed when Khushwant Singh died. When Abdul Kalam died. As the city around them ignited, Karishma developed a fear of public places, choosing instead to remain in the safe space behind her manager’s desk at Dadar Veg Treat. Dhiraj, however, was undisturbed; death was striking the city so often, so randomly, that with each spectacle of violence, the violence lost its lustre. The economy of death went down once it became available too frequently. At the end of the day, Dhiraj wondered, was McDonald’s even counting the buns they threw out in the trash when so many of their other buns grew to become perfect chicken sandwiches? But some deaths did matter. Iconic deaths to iconic people for iconic reasons. Like Kalburgi – he got shot to death for his ideas! Now that was a reasonable way to go. Dhiraj and Karishma didn’t try to conceive after Kalburgi was shot. Karishma went back to the manager’s desk, and Dhiraj headed to the Asiatic Society with a bottle of Old Monk. By the time the Swaraj Express arrived at Surat, they were already forty-five minutes behind schedule. Dhiraj uncrossed his legs and crossed them back together. He walked up and down the common passageway, from one end of the coach to the other, before returning to their compartment. He stared out the window and then stared back inside. He tried his best – which wasn’t very good – to keep from staring at Ram and the manuscript. Ram, meanwhile, looked impassive, nose-and-spectacles collapsed deep into the impossible summit of papers in front of him. He seemed untroubled by the delay; after all, he said to Dhiraj, who counts forty-five minutes in a twenty-one hour journey? “Twenty one hours and forty-five minutes,” Dhiraj corrected him. Ram turned back to the manuscript. Dhiraj followed his gaze. There was a time when they weren’t this different – Dhiraj and Ram – a time when Dhiraj knew exactly what was in his friend’s mine without needing to ask it. But time and distance had drifted them apart; and in Dhiraj’s case, time had physically aged him twice as fast. While Ram had strolled into his 40s with a linear, bony-thin shape, Dhiraj had truly let himself go; the fat rolls of Dhiraj’s stomach now extended jaggedly off the margins on both sides of his waist. “Is it finished?” Ram asked. Morning slipped into the afternoon, and before they could catch track of time, afternoon became evening. Lunch – a Railways-catered vegetarian meal of barely-cooked rice and watery black beans – was eaten and digested. Dhiraj took a nap when the sun was at its warmest peak and awoke when its yellowness had turned orange. Soon, the orange threatened to turn red. Outside Ram’s window, the country changed as they travelled further north. First, there were acres of rows of neat, square patches of green grass, grass that soon graduated into neat, square patches of green rice fields leaping higher off the ground. The greens turned to greenish-yellow, and the square patches rocketed higher off the ground into mango trees. Mango made way for jowar, jowar for bajra, and bajra for more rice. Whenever the train slowed before its next major stop, signs of urban life invaded the pristine country outside. Factories greyed the green Earth and clouds of smoke blackened the blue sky. Farms became roads and bullock-carts became buses. Another train appeared out of the unseen horizon and zoomed past in the opposite direction outside their window, momentarily blocking the sun’s yellow enlightenment. A gust of wind and noise and thousands of lives whooshed past. Inside the train, a revolving carousel of other travellers and wanderers stepped in and out of the coach all day. Old ones with their Marathi and Gujarati language newspapers, young ones with their active thumbs on their noisy cell-phones, and children who tested fate with their reckless acrobatics into every dangerous corner of the coach. People climbed aboard and people jumped off; nobody stayed around permanently. Dhiraj was sure that Karishma misremembered the first time they met, mostly because nothing about Dhiraj had been memorable. In a campus full of fashionable kurta­-jeans combinations and facial hair that confidently screamed with masculinity, Dhiraj stuck out like the only thumb that hadn’t gone sore. Waiting for his order at the St. Michael’s College chai-stall, he wore a clean white-collared shirt, which was too clean to be noticed. He had atop his head a healthy bush of hair, which had been parted and combed down too neatly to stand out. A black pen was tucked into his shirt’s breast pocket, with its cap swirled tight shut to avoid any ink-related catastrophes. He sat alone with his notebook on the only bench outside the chai-stall under the famous St. Michael’s mango tree. When Karishma and her friends passed by, looking fruitlessly for a place to sit, Dhiraj, in a rare moment of valour, sacrificed his afternoon comfort. “Would you like to sit here?” She refused. “No, thank you,” and didn’t look at him again. “No, thank you,” he repeated to himself, fished out the pen from his breast pocket, swirled its cap open, shook it with uncharacteristic violence to awaken its ink, and noted her words on the last page of his notebook. “No, thank you.” Those words had spilled out of her thin lips, said with such ease and confidence, as if she were thoroughly accustomed to addressing and rejecting strangers on a daily basis. What a woman! he exclaimed. There was a seductive inflection to her voice, as it rose louder with each word “No… Thank…You…” but remained soft and feminine through the course of its delivery. He was mesmerized. Dhiraj’s chai was delivered, and minutes later, Ram – combing his hair and lifting his trousers higher up his thin waist – joined him on the bench. Dhiraj soon forgot what Karishma looked like, but he didn’t forget her voice. She had spoken to him, and he was determined to hear her speak again. Three days after that first encounter, Dhiraj won St. Michael’s Young Scholastia Award. His first poem was published in the college newspaper and then reprinted in the Sunday supplement of The Times of India, accompanied with a tiny, black-and-white photograph of him and his clean white shirt. Suddenly, he had fans. The next time he was basking under the shade of the mango tree, Karishma invited herself to sit beside him. She introduced herself and told him that she had “genuinely loved” his work. And, Dhiraj learnt, according to Karishma, this is how they first met. Within three years of that meeting, Ram helped Dhiraj publish the first and only volume of The Rakshas Chronicles with InkFest Inc. Four years after that meeting, Dhiraj and Karishma got married. Within five years, they failed their first deliberate attempt at conception, and within six, all of Dhiraj’s liquid assets froze to the very solid shapes of vada pavs and vegetarian burgers at Dadar Veg Treat. Ram’s career with InkFest took off after the success of The Rakshas Chronicles, which had kick-started the genre of mythological Indian fiction. 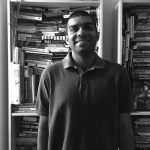 In his footsteps, Ram and InkFest launched evolved upgrades on Dhiraj, authors who wrote science-fiction books about flying vimanas, authors who turned Hanuman into the Superman of Primates, authors who reimagined the country’s greatest emperors as hypersexual maniacs that impregnated half the women in the kingdom. But he didn’t. Instead, the almirah behind the desk in Dhiraj’s office was stuffed with stacks and stacks of paper, of letters and spaces becoming words and sentences, and of sentences making up paragraphs, stretching out to hundreds of pages. Some pages were written by hand with his pen, some written in faded pencil, some printed out from his computer in fonts of all ranges from the exotic to the mundane, and some containing coded Venn diagrams and bar graphs that only Dhiraj himself could decipher. Dhiraj had started working on his second novel the year the first McDonald’s opened in Mumbai. After writing twenty-seven pages, he scrapped his plans, drank a bottle of Old Monk to himself, and started writing again. Three months later, he threw out his work, lost half of the hair on his shiny brown skull, found himself drinking half a bottle a day, and started again. This one felt just perfect. He wrote a hundred pages, then a hundred more, and while Karishma toiled on the manager’s seat scolding away cooks, waiters and delivery boys, Dhiraj assured her that he had cracked the perfect writing formula. Six years later, he vomited his vegetarian dinner on his work after another heavy night of drinking, scrapped it, and started again. When Karishma barged into his office one day, violating what he had insisted was his sacred space, they enjoyed a conflict of epic proportions. She lit an agarbatti to ward off the smell of stale dark rum and placed it in front of Dhiraj. She moved past the meek opposition of his trembling hands into his almirah and threw up all his papers into the air. With a thousand serene, silent crashes, Dhiraj’s life’s work rained gently down to the ground. Karishma stormed out of his office, never to enter it again. Death, Dhiraj thought to himself. Death, the neatest of finishes. The only conclusion that made sense. Ideas continued to float harmlessly past his mind. He thought of a world where paper was edible to feed the starving hungry, but the starving hungry forgot to plant more trees and ran out of paper. A universe where husbands lived in peace without their meddling wives, but their species ended without the assistance of wives to meddle with. Of an immortal species, unaffected by death, growing older and older and remaining incomplete and ugly and unhappy until the universe dissolved those grotesque villains within itself. No, death was a neater, more beautiful solution than villainous immortality. Death cured everything. Every unfinished life, like every never-ending story. Dhiraj bent down and began to stack up his papers again. It took him hours, and when he was done, he had placed the papers back into his almirah. He tied a string around the stack and knotted up the thread on top with a perfect, neat bow. Dhiraj jumped off his berth and peeked his head out to the common passageway on the AC 3-tier train, ensuring that there was nobody around within earshot. He closed the curtains and sat back down opposite Ram. He wondered if Ram could hear his thumping heartbeat. “I’m going to fake my own death,” Dhiraj rubbed his hands together. Seven months before MM Kalburgi was shot, Perumal Murugan announced his death. “The writer is no more,” Murugan had said, before retiring his pen, or his typing fingers. Dhiraj’s first reaction, of course, was to head to the library and search the darkest corners of the internet to find out who Murugan was and what he had written. Dhiraj couldn’t believe that an author’s retirement, their literary death, could give them more fame – or infamy – than their work ever did. Seven months later, while Dhiraj again scourged libraries and the world wide webs to find Kalburgi’s work, he snapped his fingers together in morbid triumph. “Death!” he exclaimed to himself. “I’m killing your internet connection,” Karishma exclaimed to him when the bill arrived a day later. Karishma had already enforced restrictions on Dhiraj’s phone usage, his alcohol intake, changed their bread wholesalers to get a cheaper deal on pav, and kept Dhiraj to a strict limit on the number of pages he was allowed to print every week from the computer services store down the road. The last of these restrictions severely dented the masterwork stacking up between layers of dust in the almirah behind Dhiraj’s office desk. He minimized the font sizes, stretched out the margins, and, in the last-case scenario, started writing more by hand in loose pages ripped out of cheap notebooks. This proved to be harder than he had anticipated. Thoughts came quicker than his fingers could hold them and move pen on paper. On his 44th birthday, his right hand stopped being still. Words went awry from one part of the page to another, and it became tougher than ever for him to chase them down. When he tried to switch to his left, the shaking got worse. But he drank some more and kept writing. “You’re getting old, Dhiraj!” Karishma told him the next day, as he struggled to keep his hand still while signing a cheque. She grabbed his hand and proceeded to direct the twirls and squiggles of his signature on paper. “I’ll do it myself,” he repeated. When he reached to brush back his hair, he discovered that there wasn’t much left. Karishma grabbed his hand once more, but this time, her touch felt softer, more tender. Dhiraj sighed and relaxed into his wife, into the woman, the once-cheerful voice that he was surely in love with. He felt the need to say something. What about her? Dhiraj didn’t know. He had other worries. And frankly, she did, too. City and property taxes were increasing quicker than Karishma and Dhiraj could earn, and no amount of vegetarian burgers could satiate the pile of unpaid bills. Soon, there weren’t enough burgers to satiate their hunger, either. InkFest were convinced and promised Dhiraj a pre-publishing bonus on his contract as soon as he would submit his first manuscript. The promised sum was to be a small piece of paper worth all the others he had wasted over the years, a cheque worth a lot of rupees – “How much exactly, Dhiraj?” Karishma enquired – which he never specified. He mentioned, however, that it would pay for their debts and definitely retain his internet connection. Three months later, Dhiraj didn’t feel like he had the perfect ending to his story, so he drank some more and kept writing. And it had been a whole year since that final deadline that Dhiraj convinced Ram to sit on a twenty-one hour train to New Delhi with eighteen hundred and twenty-seven pages of his mostly finished manuscript. The train was only an hour and a half late from its scheduled stop at the Nagda Junction. The sun outside had set and Ram had turned on the flickering white tube-light in their compartment. Over a dinner of chicken kathi-rolls off the platform, Dhiraj told Ram how he planned to kill himself. Ram ate carefully, slowly, biting the middle of the roll first before getting out to its circumference to minimize spillage. Dhiraj, however, ate with reckless abandon; half of his dinner landed up on his shirt, and some on his manuscript, too. Ram’s voice trailed away; he placed the manuscript back down and picked up his roll. Dhiraj took one last bite and chewed down the remaining bits of his roll. “Are you serious about this?” Ram asked. Soon after midnight, the Swaraj Express dropped off some passengers and picked up other new ones from Madhopur, and the reverberations of the restarting engines shook Dhiraj awake in the dark compartment. He woke to see that he had fallen asleep under a pile of his own work. On his right hand, he tightly held on to his pen and on his left, another piece of half-written paper. The eighteen hundred twenty eighth. Typed papers covered his legs, hand-written scraps were crumpled up over his stomach and around his heart, and a blank piece was slipping slightly off of his forehead. When Dhiraj turned to his side, he saw that Ram was awake, too. “Dhiraj..?” Ram called to him. Dhiraj yawned and opened his eyes wider. Ram was propped up on his seat, shirt tucked in, hair neatly parted, spectacles already on. Dhiraj smiled; he pushed aside the papers around him and sat up. Slowly, Dhiraj sat down on his berth, and a few moments later, lay down on his back again. He rolled between the pieces of his manuscript, placed a shivering pen on an unfinished piece of paper, and began to scribble more words down. Ram took a deep breath and lay into his bed, too. He reached over and turned the light off. Dhiraj kept scribbling in the dark. A thousand kilometres away, Karishma woke up earlier than the first rays of the summer sun, and hypnotically, unconsciously, completed her morning rituals. She covered her head with a dupatta and walked down from her apartment – barefoot – to the silent, dark canteen. In her right hand she held a tiny bell, and in her left, her metal aarti plate, carrying cotton wicks, ghee, an agarbatti, a gold pendant, and a bright yellow marigold which lightly illuminated the dark morning. At the manager’s desk she bowed to the chubby Ganesha idol and prayed for Dadar Veg Treat, her unconceived child, her parents, and her husband. The stone elephant looked upon her with a silent deadpan on its little eyes, and when Karishma was satisfied with the silence, she walked out to open the canteen. Outside, she passed on those deadpan blessings: she lit her agarbatti and folded her hands together to give the canteen a final salute. Finally, she took her dupatta down. That’s when she found Dhiraj’s suicide note, one folded piece of white paper slid casually under the shutters. She screamed. “Dear Karishma, my wife,” were the first words. Dhiraj had written the note on the smallest of scribbles. He had left no space on the margins to make the most of every inch on both sides of the A4-sized page, like the papers he printed his stories out on. The words shook violently, oscillating in dangerous waves from one to another, evoking the frenetic desperation of Dhiraj’s shaking hands. He rambled on much longer than required, and while Karishma appreciated him not wasting extra space, she still felt that he managed to leave his farewell unfinished. “And although I couldn’t leave you with my bloodline, I leave you with –” were his last words before the back page ended. She flipped the page on both sides a few more times. There was nothing more. Karishma put away the arti plate, found her phone, and furiously dialled her husband’s number. Fourteen long, empty rings later, she tried again. And again. And again. A thousand kilometres away, Ram woke up a few hours outside of New Delhi. His phone had begun to ring, too. He pressed his hair into a side-parting and buttoned the loose top button of the shirt he had slept in. “Where is he?” Karishma shouted from the other end of the line. “He left a piece of paper with me,” she said. Except for a few orange streaks of the rising sun peeking through the window, it was still mostly dark in the train. Ram closed his eyes for a moment to listen to the sound of the train pulsating on the track. Dhun-dhun Dhun-dhun Dhun-dhun Dhun-dhun it went, on and on, at a consistent, even speed, with no inflection in pitch or pace. Within moments, Ram’s heartbeat synchronised itself to the beat, too. Or was it the train that had waited to get in-synch with his heart? Ram put the phone down on the table beside him and heard the drumming get louder. He got up off his berth, pulled his trousers appropriately high up above his belly-button, and walked across to where Dhiraj wasn’t. Instead of Dhiraj’s oblong, unaligned margins, there were papers. Hundreds of hundreds of papers. One thousand, eight hundred, twenty seven papers, plus one more that Dhiraj had written over the course of the journey. They were spread across the length of the berth, shrouding his friend’s invisible body. Ram smiled and he understood. He shuffled the manuscript back together; some parts in order, some not. By the time he was done, the renascent sun had brightened up his lonesome compartment, with nowhere else to go that morning than up higher. Outside his window the country-side changed into a small town and the town soon rose into a minor metropolis. The Swaraj Express slowed down on the tracks as it reached Delhi. Five hours later than schedule, but at the right time. This wasn’t the end of the journey of course: the train would go on through Haryana and Punjab and as high it could in the country all the way to Jammu. But this was the end of the tracks for Ram. He reached for his phone and dialled the InkFest office the moment the clock struck nine. And when the train stopped, Ram hopped off without a second look back and headed to the publishers.